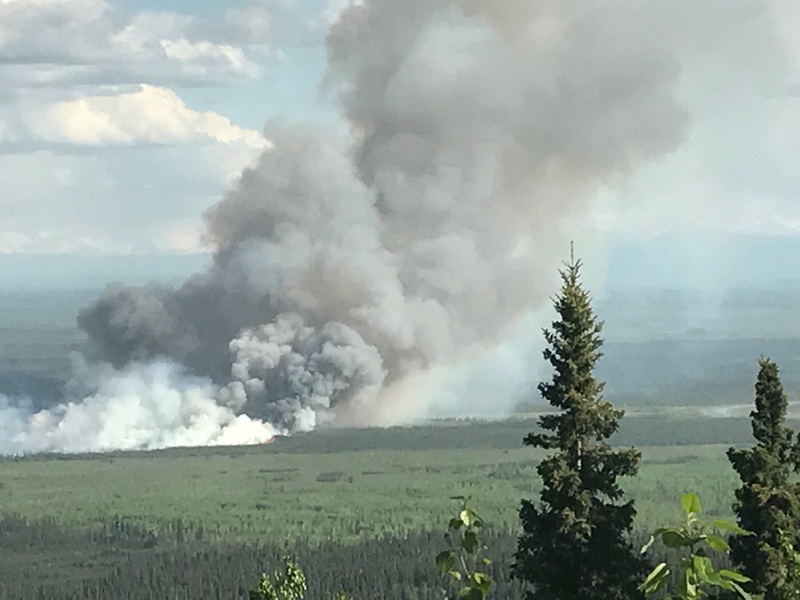 A wildfire about 15 miles southwest of Fairbanks is now estimated at approximately 320 acres and more than 80 firefighters from the Alaska Division of Forestry and BLM Alaska Fire Service are either on scene or enroute to contain the fire. The fire was initially reported at 30 to 60 acres but better scouting by aircraft resulted in the larger estimate. As of 9:30 p.m., fire behavior had moderated due to higher relative humidity and the fire was no longer growing. The Livingston Fire was reported at 5:18 p.m. after several members of the public reported seeing lightning strikes in the area about 15 miles southwest of Fairbanks. The fire is approximately 5 miles east of the Parks Highway and west of the Tanana River. Personnel were not able to reach the fire via road because of wet conditions and firefighters are being airlifted in to battle the fire. There are five cabins located approximately 1 mile east of the head of the fire, which is moving southeast toward the Tanana River. A load of eight smokejumpers from the BLM Alaska Fire Service were air dropped to protect the cabins and another load of eight smokejumpers were dropped to attack the fire directly. Three 20-peson crews – two hotshot crews from BLM AFS and an initial attack crew from the Division of Forestry – were being transported by helicopter to assist with containment of the fire. A Division of Forestry air tanker based at Fort Wainwright dropped multiple loads of retardant around the fire to box it in and prevent it from spreading, giving crews a chance to attack the fire from the north and south flanks. Four water-scooping aircraft from the BLM Alaska Fire Service and a Division of Forestry helicopter also responded to drop water on the fire. The fire is the first significant wildfire of the summer in the Fairbanks area and coincided with the warmest, driest weather of the summer. The high temperature reached 72 degrees in Fairbanks on Sunday, tying it for the highest temperature recorded at Fairbanks International Airport this summer. The warm temperatures triggered thunderstorms in the Fairbanks area late Sunday afternoon, resulting in numerous lightning strikes.